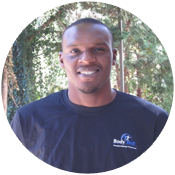 Terence is a Licensed Massage Therapist originally from Cameroon, and based in Montgomery County Maryland with several years of experience in health care. His athletic experience with Tennis, Soccer as well as Track and Field compelled his interest in improving the health and wellness of fellow athletes. “As an athlete I found myself trying to help my team mates improve their physical conditions during events. I believed that it would improve their performance. So In an attempt to better explore that passion and be of better service, I decided to go to school for Massage Therapy.” He has been trained and has mastered a wide array of techniques to manipulate and stretch tissue, which helps to alleviate pain and increase range of motion and enhance performance. Terence is also adept at Swedish and Hot Stone Massage which promotes relaxation. He attended NMTI in Falls Church, VA. Since his graduation has built a satisfied and dedicated group of clients. Having volunteered for several local sports teams and groups, giving back is certainly one of his priorities. People are his passion and improving their well-being is his goal. He enjoys volunteering for the DC Diplomats Handball Team and Calvery Camp Ground.